Voting for the vocational panels and the university panels is currently ongoing with the votes for these constituencies due to be counted in a few weeks time. Voting for these panels is not organised on a geographical basis – there are no geographical constituencies – and hence one would not expect a significant spatial basis to be uncovered for these contests; furthermore without tally figures there is no basis for to detect if voters do vote geographically – preferring candidates from their own constituency or region when it comes to casting their votes. But a study of candidate-selection, voting and seat trends for the vocational panels would suggest that there is a hidden geography at play in these contests. The electorate for the five vocational panels is comprised entirely of elected politicians, involving incumbent TDs, Senators and city and county councillors, with the total electorate amounting to just under 1,100 voters. By large, the bulk of the electorate is drawn from the councillor body, with the 883 county and city councillors amounting to just over 80 per cent of the total number of eligible voters. Thus parties’ relative prospects in the Seanad contests will be largely dictated by how well these parties fared in the 2009 local elections. This is relatively good news for Fianna Fail – while their results in the 2009 local elections compared weakly with their results in the 2004 and 1999 local elections, the percentage of seats the party won in the 2009 contests was significantly higher than the proportion of seats won in the general election. With also a not insignificant number of Fianna Fail Senators with votes for these contests, Fianna Fail’s results in these contests will undoubtedly compare favourable with their general election results. The dominance of the councillor cohort amongst the Seanad electorate also means that there is a geographical bias at play in the vocational panel elections, with the bias favouring more rural constituencies (especially those in the Midlands) and also favouring two-county constituencies. Why is this? While the population per TD ratio is held relatively constant for general election contests, each county is treated as a separate unit when it comes to deciding local election constituencies and seat allocations. Many rural counties, with low population densities, such as Leitrim and Roscommon, have as many county councillors as more urbanised counties and the city council areas. The population per councillor ratio in Ireland’s lowest populated county, Leitrim (22 county councillors), is 1,316, while the ratio for Fingal (24 county councillors) is almost ten-times higher at 10,000. Thus, the more rural counties are electing more councillors and hence constituencies from these areas will have a significantly higher number of voters for the Seanad vocational panels than more urban constituencies will. 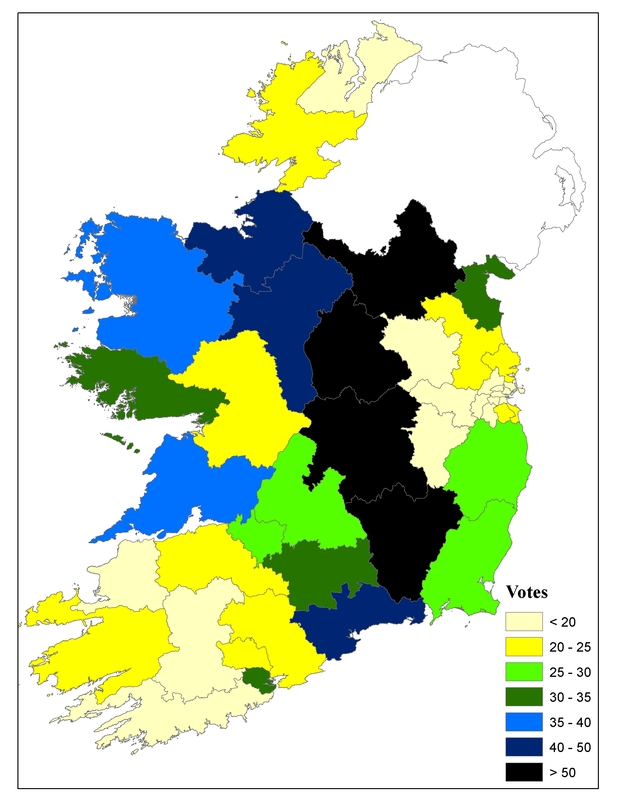 This is especially the case for two county constituencies, with constituencies such as Laois-Offaly, Longford-Westmeath, Carlow-Kilkenny, Cyavan-Monaghan and Sligo-North Leitrim, as well as Waterford (involving the Waterford county and city councils) having forty or more eligible voters for these contests, in stark comparison to constituencies such as Dublin North West and Dublin North Central which have roughly around ten eligible voters. However, the larger rural counties, such as Cork, Kerry and Donegal, are also under-respresented here – almost to the same degree as the more urban/Dublin consittuencies given than these counties have significantly larger populations than their smaller rural counterparts but do not have significantly larger numbers of councillors representing them. For the Trinity seats, I found that 44% of voters (the majority since since 1980) give Dublin addresses. This is boosted by the DIT grads (16% of electorate). (The strong concentration on the Greater Dublin region will) increase with time, in the unlikely event that the constituency were to continue in existence, because the younger voters are predominantly from Dublin and the commuter belt. In my door-to-door canvass of Bray (classic commuter belt), I found that most voters had moved to other parts of Ireland, such as Kilkenny, Limerick or Tipperary (surprisingly rarely abroad) so I talked to the parents. Most parents had not been to a university, while some had NUI votes. Very few parents had trinity votes. Many of the voters who were still there had NUI and Trinity votes, with primary degree from one and Masters from another. This entry was posted in Election data, Electoral Geography (voting maps), Seanad election and tagged Constituency size, maps, Seanad. Bookmark the permalink.